“I absolutely believe in these debates and think they are great … I think it is great we are having these debates and I hope they go some way to restore some of the faith and some of the trust into our politics because we badly need that once again in this country … I think these debates are here to stay. They clearly engage people in politics which is what we need”. Yes, Young Dave said that. But that was five years ago. Look cheps, there's a suitable debate-dodging excuse over there! Jolly good sheow!! Now, after a welter of excuses - as if Cameron, or any of his jolly good pals, gives a flying foxtrot whether the Greens, Plaid Cymru or the Scots Nats are invited - our brave and principled Prime Minister has turned tail and run away, leaving his spokesman Craig Oliver to dispense the apologia, blaming the broadcasters for causing “chaos”, “by attempting to dictate the terms of debates and repeatedly altering their proposals”. This is what 2010 Cameron said about excuses: “If you want the TV debates to go ahead you have got to do it fairly between the main parties and look, having said I want them, having challenged people to have them and quite right, Sky saying let’s have them, it would have been feeble to find some excuse to back out so I thought we’ve got to stick at this, we’ve got to do it. It will be challenging, it was, but I think I came through them”. Dave was still in favour in 2012, despite not delivering the expected trouncing of Pa Broon two years previously, and those debates having been used by Corporal Clegg to put himself centre stage: “On TV debates, I’m in favour of them, I think they’re good and we should go on having them and I will certainly play my part in trying to make that happen … I think TV debates are good. I enjoyed them last time – particularly the last one”. Even last year, Cameron was chiding those who might pull out of debates in the future: “Blair pulled out against, against Major and Major pulled out against Kinnock, Thatcher pulled out against Callaghan. I’ve just always believed that these need to happen. It’s good for democracy. It’s good to see”. It’s all so different now, isn’t it? It’s also glaringly obvious why Dave has run away: he is, to quote Mrs T., frit. His decision exposes the right-leaning press’ portrayal of Mil The Younger as useless as the baseless hot air that impartial observers knew it was all along. Without the partial spin of the grovelling pundits, and the baying Government benches behind him, Cameron is frightened shitless of having to debate Miliband. Dave would get rattled and tetchy; Ed would just keep on flying that attack plane straight and level. A one-on-one debate - and remember, these are the only two credible contenders for occupying 10 Downing Street after the General Election - would provide no opportunities for “yah boo you look like Gromit’s pal” or “your Dad was a Marxist”. For once, Cameron would have to pony up real answers to real questions. 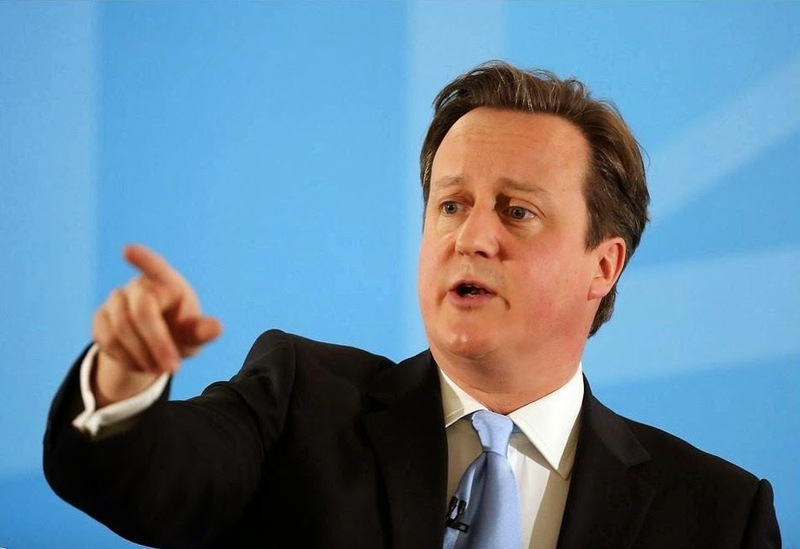 Dave can hear Mrs T’s words ringing in his ears: “The Right Honourable gentleman is afraid of a debate, is he? Frightened. Frit. Couldn’t take it. Couldn’t stand it”. Not just frit but lying. Blair didn't pull out against Major in 1997, it was the other way round. Hezza represented the government in a three-way (sorry for the image) vs Blair and Ashdown. Who tag teamed him into the floor. So Dave's plan is one 90 minute debate featuring 7 party leaders. Deduct a bit for host to open, introduce topics and finally close then average out - barely 10 minutes talking time each for their whole party cases. Don't expect much in the way of details! He won't have much time to make himself look stupid, the others won't have enough to put their case forward.